Oh, Gutenberg: the topic of so many developer and WordPress conversations in the past year. Since Gutenberg itself is still in a constant state of flux, learning more about its inner workings definitely proves to be challenging as certain elements are deprecated or move around within the core library. However, here are some of the things I’ve gleaned from beginning to poke around that I thought others might find useful. Blocks block blocks. 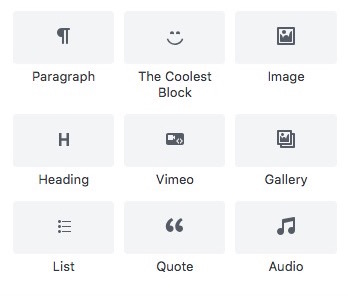 Gutenberg is blocks. Gutenberg is a React couch with a WordPress slipcover over it. It’s the new iteration of the WYSIWYG editor for WordPress, which will lend itself to further customization and a different page-builder-except-totally-not experience within WordPress. Right now, there are posts, pages, menus, widgets, the Customizer…our cup runneth over with options! Part of what it seems Gutenberg aims to do in the long game is to consolidate everything into block components while replacing the TinyMCE editor. Note: this post assumes you have a local WordPress install in place with a theme (I used Twenty Seventeen) with the Gutenberg plugin both installed and activated. Prior to tweaking any code, I installed the “React Templates” as well as Babel packages in Sublime to assist in my syntax highlighting. How to use comments in JSX. // Imports and Variable assignments. // What we can interact with. // What you want sent back to you. If you want your block to …well, do anything (like edit text), you have to use the attributes object, which is Gutenberg’s state management system. It’s a top level object that keeps track of properties and what has changed. For each thing that you want to be editable, you’ll need a corresponding attribute. The block’s output is a function of its attributes. Attributes in Gutenberg track the present condition of data (state) in a block. This is how the block looks behind-the-scenes in the Dashboard’s editor. The edit() function let’s you customize the interface. For those familiar with React, this is similar to the render() function. This is what your block looks like on the front-end. It defines the way the different attributes should be combined into the final markup. This is then serialized into post_content. This is apparently how backwards compatibility is maintained so your content will remain intact if Gutenberg is disabled. I’m going to continue my explorations by, fingers crossed, creating my own custom block with editable fields. Wish me luck! For now I’m comfortable bypassing further understanding of this configuration step in order to be able to tinker more with the actual block building process. To be honest, at this point my text editor still wasn’t completely to my liking in this arena but I tried to move past it in order to get a move on with the Actual Work™️ I was attempting to do.